Getting beyond the mantra "eat more veggies and fruits" to the practical side of eating them is a struggle for many. Statistics tell me that most American's are eating less than 3 total servings. Recent studies are suggesting you may reduce disease risk by pushing beyond the "5 a day" rule and shoot for 7 servings of veggies and fruits per day. Beyond the obvious advice - eat them as snacks, at meals, pack them in your gym bag, how do you creatively add more to you diet? Roast, steam, and saute then add them chopped or pureed into a sauce for pasta, fish, or other meats. Mince them up and add them to rice or other grains as they cook. You'll add flavor and texture. Slice cucumbers, bell peppers, avocados and layer them as a veggie sandwich. Spice it up with hummus. Combine fruits and veggies into a salsa for baked tortilla chips, Mexican dishes, eggs, or top roast meats and fish. Have fun experimenting with flavors and textures. 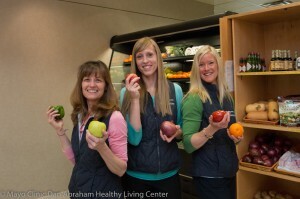 Want more ideas, check in with myself or the other DAHLC dietitians and chefs.